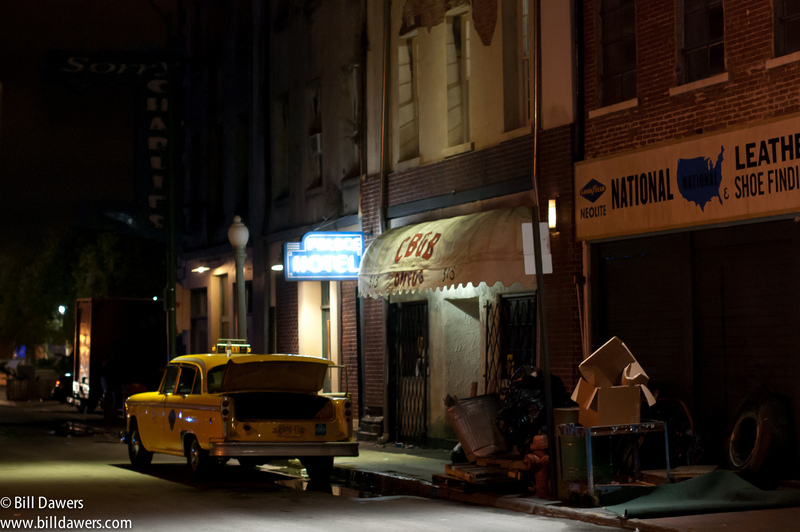 CBGB has finished principal photography, and it appears that the filming has left Savannah’s public stage. As many of you know already, I’ve been following the shoot pretty closely, and I’ve been especially interested in the effect of Twitter and other social media in allowing fans and stars to engage each other. Twitter posts are generally public, and there’s an easy feature to embed them in websites. So I’ve selected here a more or less chronological collection of entertaining Tweets that chronicle the movie shoot. The biggest flurry of public excitement was during Rupert Grint’s time here playing Cheetah Chrome of The Dead Boys, but you’ll see more direct engagement with the city from the movie’s stars, including Ashley Greene as Lisa Kristal, Malin Akerman as Debbie Harry, Stana Katic as Genya Ravan, Ryan Hurst as Mad Mountain, Joel David Moore as Joey Ramone, Freddy Rodriguez as Idaho, Donal Logue as Merv Ferguson, Richard de Klerk as Taxi, Peter Vack as Legs McNeil, Mickey Sumner as Patti Smith, Julian Acosta as Johnny Ramone, Steven Schub as DeeDee Ramone, and Katherine DuBois as Genya’s friend. There’s also a great pic of Taylor Hawkins at The Jinx. If you’re just looking for photos, click here, here, and here. Click here to scroll through all my posts about CBGB. @markezrastokes love this town. Such a generous place! With generous people. Thank you Savannah, GA for a beautiful time. Thank you Catfish Staggs and Eric Culberson for guiding us on our journey. Last day on @CBGBtheMovie. An enormous thanks to #Savannah for treating me so well. Have to come back& shoot here again. “@FreddyRdriguez:2the cast&crew of @CBGBtheMovie,thanks4all of ur hard work.Randy,Jody,Alan-love u guys.Great working with u again.” u rock! That’s a wrap on @petervack, @donallogue and @FreddyRdriguez ! Thank you guys for making #cbgb #movie a #PUNK #rockin good time!